At the pep assembly on Tuesday, Nov. 29, head football coach Joel Applebee helps award junior Brody Flaming as Student Athlete of the Week. 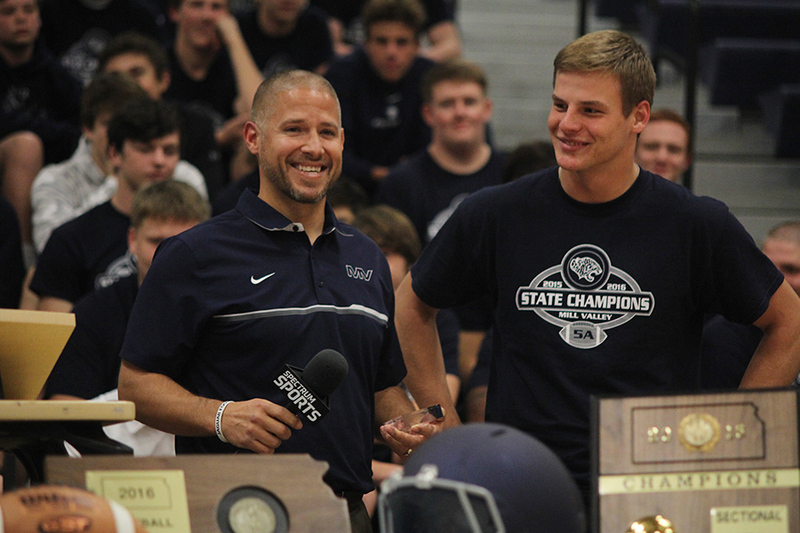 Students filled the bleachers during seminar on Tuesday, Nov. 29 to honor the football team on its second consecutive state championship title. The assembly was hosted by TWC SportsChannel anchor Mick Shaffer and performances by the Silver Stars and cheer team gave the atmosphere a boost. Shawnee mayor Michelle Distler also made an appearance and delivered her speech congratulating the team on its achievements as well as making a proclamation that it was Mill Valley Day. Introduced by defensive line coach Eric Thomas, head coach Joel Applebee gave thanks for the support of the school and recognized the achievements of the team. Applebee also used his time to thank the senior players for their contribution to a successful season. “[The seniors] are big leaders in our group and they really did a good job of showing the underclassmen what it takes to get the job done week in and week out,” Applebee said. Following Applebee, Shaffer presented junior quarterback Brody Flaming with the honor of being the Student Athlete of the Week. According to Flaming, winning the second consecutive state title resulted in a morale boost at school, which was seen as the students rushed the field after winning the state championship game on Saturday, Nov. 26. Overall, the assembly celebrated the hard work of the players and the final season for the current seniors on the team.